OMG, we thought we’d seen it all. We really did. But we were wrong. SO WRONG. There we were, innocently surfing the web looking for Mother’s Day deals, when we chanced upon KFC’s astounding new Mom’s Day giveaway. Well, it’s not mild. It’s spicy. It’s “Tender Wings of Desire,” a romance novella featuring Col. Sanders himself as the love interest. Yes, you read that right. Mothers — or anyone, really — can download this cultural artifact here on Amazon absolutely free for a limited time. It’s an ebook, which unfortunately means you can’t display it proudly in a prominent place on your bookshelf, and that’s too bad because we totally want to do that. We totally would if we could. However, KFC says it also plans to surprise 100 fans on Facebook with the chance to win dinner and a hard copy of the book. As of this writing, the only thing about the novella on KFC’s Facebook page is a link to this YouTube video, which starts out with: “This Mother’s Day, let Col. Sanders take care of dinner — and Mom’s fantasies.” The video gets even more bat$&%# crazy from there. So why is KFC doing this — other than the fact its advertising executives are apparently smoking crystal meth or something? I mean, this is the restaurant chain that gave us fried-chicken-scented sunscreen, secret-spice-scented candles and chicken-flavored edible nail polish. It turns out that Mother’s Day is KFC’s best-selling day of the year. The restaurant chain sees a 40% jump in sales, serving about 380,000 families on that day. For those of you keeping score at home, that’s 6.5 million pieces of chicken, 900,000 servings of mashed potatoes and gravy, and 480,000 helpings of coleslaw. 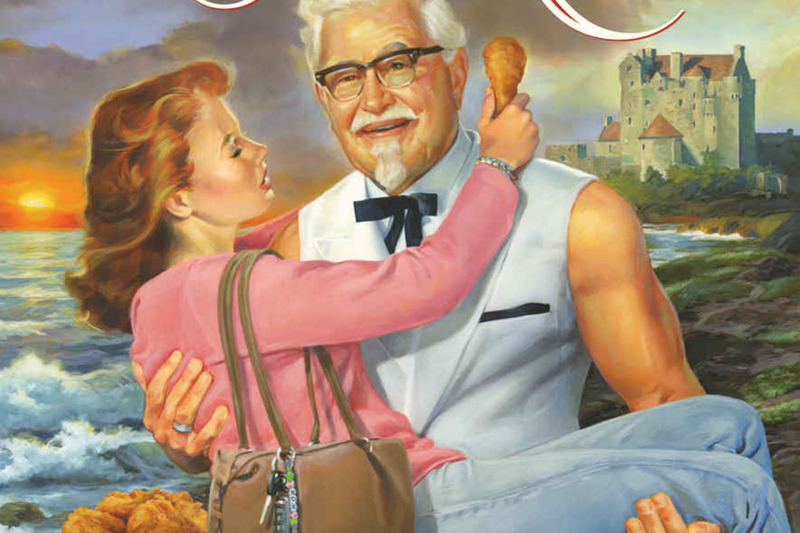 “Tender Wings of Desire” is KFC’s very first romance novella, just in case you were wondering. As you read this bodice-ripper, you might embrace it as a fun, free publicity stunt. Or it might leave you deeply disturbed, with emotional scars that will last a lifetime. But if you ask us, the Colonel makes a natural love interest. After all, women love a man in uniform. And we have no doubt that our hero will bring his secret blend of herbs and spices to the occasion. No word yet on whether he’s a leg or breast man. Your Turn: You choose — Fabio or the Colonel? Mike Brassfield ([email protected]) is a senior writer at The Penny Hoarder. He’s deeply ashamed for having written this, yet he feels an undeniable craving to eat an entire bucket of chicken by candlelight right now, with a glass of Chianti.